You can always tell a good movie when you didn’t once look down to see how much longer it could possibly run. You can be sure other people have liked it when the buzz surrounding it is so strong that it’s held over at the movie theatre by popular demand. And of course, the fact that it also has been nominated for five Oscars is something that works well in its favor. Enter single mother Vianne Rocher (played by the always stunning Juliette Binoche, Oscar winner for The English Patient) and her daughter Anouk (Ponette star Victoire Thivisol), who instantly stand out from the landscape in their bright red hooded capes. It is the beginning of Lent and the whole village is taken up with thoughts of abstinence and penitence, while Vianne settles in to a little patisserie leased to her by Armande Voizin, played by Oscar-winning legend Dame Judi Dench (Her Majesty Mrs. Brown, Shakespeare in Love). Due to her unwed single-mother status and the fact that she is opening a sinful chocolaterie at the beginning of Lent, she immediately rubs town mayor, Comte de Reynaud (Alfred Molina of Boogie Nights), the wrong way. Supporting him on this front is his secretary and Armande’s uptight daughter, Caroline (Carrie-Ann Moss of The Matrix). He even uses the new parish priest (Hugh O’Conner, whose sermons and rendition of “You Ain’t Nuthin’ But a Hound Dog” provide some of the funniest moments of the film) to preach his anti-chocolate message by effectively re-writing the poor young priest’s homilies. Despite the Compte’s effort to turn the townsfolk against Vianne, she manages to build up a clientele of faithful friends and followers, including Guillaume Blerot (Sir John Wood, from The Ideal Husband); his love-interest, Madame Audel (Leslie Caron, a.k.a. Gigi); and a married couple for whom Vianne’s chocolate concoctions are a valuable aphrodisiac. The film manages to maintain its comedic elements while still encroaching on very serious themes. Vianne’s friend and client, Josephine (Hallström’s wife, Lena Olin), is being abused by her husband, and under the influence of Vianne and her chocolate concoction (Vianne has the ability to guess at her customer’s “favorite” chocolate, thus facilitating some sort of emotional release within them), Josephine finally finds the courage to leave him and help Vianne in the chocolaterie. It is from this point that the show becomes more serious, with Vianne rehabilitating Josephine through friendship and chocolate, while the Compte attempts to reform her drunken husband Serge through penitence and discipline. Olin performs extremely well in her role, effortlessly combining the strong and the fragile aspects of Josephine’s emotional character. At the same time, Vianne acts as a force trying to re-unite Armande with her grandson, Luc, whom her estranged daughter Caroline has forbidden her to see. Greater conflict arises when Caroline reveals that Armande is a diabetic for whom the indulgence in chocolate may prove fatal. In some ways, Moss is the weak link in the film, seeming unable to match the incredible acting ability of Dench or Binoche in her scenes with them. She even has difficulty with the accent (many of the actors chose to adopt “Frenchman-speaking-English” accents), with hers wandering somewhere between North American, British and French. Enter Roux (handsome Johnny Depp from Edward Scissorhands and Cry Baby), a charming Irish “river-rat”. A romance naturally ensues between Vianne and the handsome gypsy – which results in some wonderfully intense scenes between the pair – whose band of river travelers are also condemned by the Compte. Vianne tries in vain to guess his favorite chocolate, while Roux endures repeated failed attempts to fix the squeak in her door (interpret as you will). The film’s dramatic climax unfolds as, on the verge of Vianne’s complete ostracization from the town, and the re-entrance of the North wind with whom she always moves on. Armande convinces Vianne to throw her a party, immediately following which she will check into a retirement home. The party is a great success, re-locating to Roux’s riverboat for some music and dancing. This anti-Lenten merriment is reported to the Compte by Serge (who has reverted to drunkenness after Josephine rejects his efforts at reconciliation). The Compte replies that “something must be done”, prompting Serge to take it upon himself to set the riverboats ablaze. It seemed as if the movie was getting a little too serious for its own good and forgetting its unassuming comic roots, but eventually no real tragedy ensues and the end seems to justify the means. In the end, the film admirably deals with Vianne’s nomadic existence and the implications of raising a child under such conditions. Vianne makes the decision, much to her daughter’s jubilation, to remain in Lansquenet with Roux, offering the ashes of her mother (in whose footsteps Vianne had been following in lifestyle and profession) to the relentless North Wind. She finally guesses Roux’s favorite chocolate; he fixes her front door; Luc and Caroline enjoy a renewed relationship; Josephine continues to find herself through her independence from her husband; and all in the town, even the Compte, realize the value of the pleasure principle. 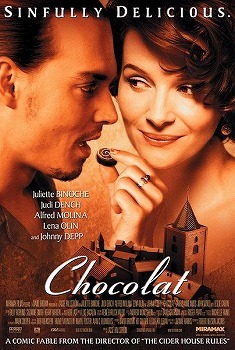 There is something for everyone in Chocolat, be it a moral, a little fun, a little romance. While never encroaching too much on its audience, it gently reminds us about the value of tolerance and the necessity of change while pitting human pleasure and self-fulfillment against rigid morality. They ultimately find a healthier balance between them. With a stellar ensemble cast of both adults and children (who if not for their artistry could be called acting machines), an idyllic setting and an endearing fable-like story, Chocolat is a must-see. If you are one of the few people that still haven’t seen it, you’ve missed a treat. I hope it wasn’t one you denied yourself with the intention of doing something less self-indulgent!